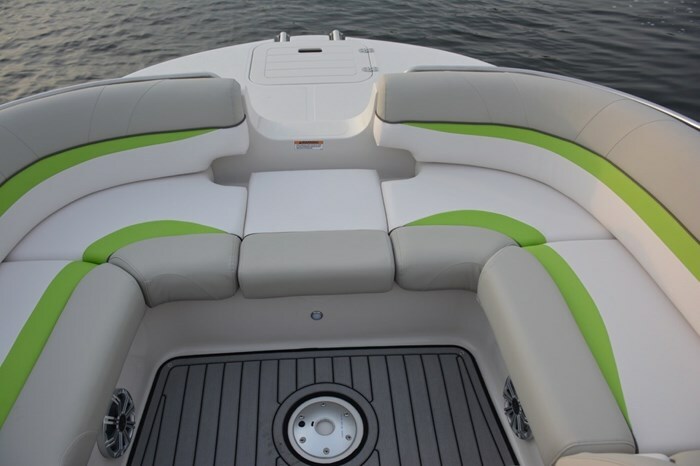 Starcraft markets the Sport Star Step 220 I/O as the quintessential deck boat. They even say that with the tall windshield it’s perfect for the Canadian market. We went to Lake Tippecanoe Indiana to sea test their words. 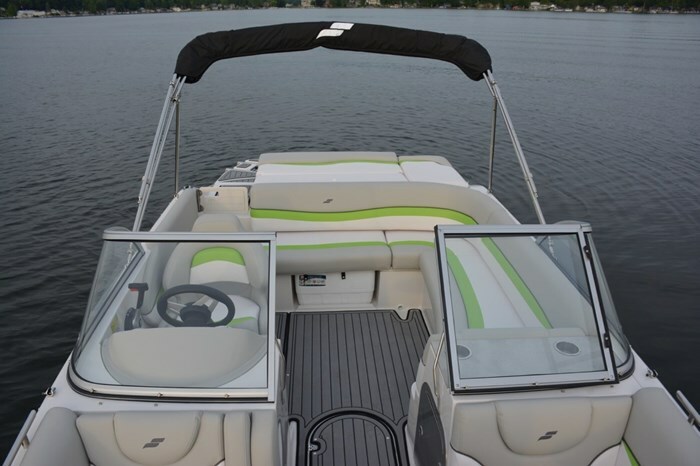 If first impressions really do last forever, then the first impression of this boat was wow! The graphic lines from hull to deck are beautifully paired and the interior space from bow to cockpit to stern is absolutely massive. While our test model is available in a side console floorplan we were given the opportunity to run a configuration with an L shape cockpit lounge and Starcraft’s in house Sport package. From that first impression we began to dig deeper beginning at the bow. 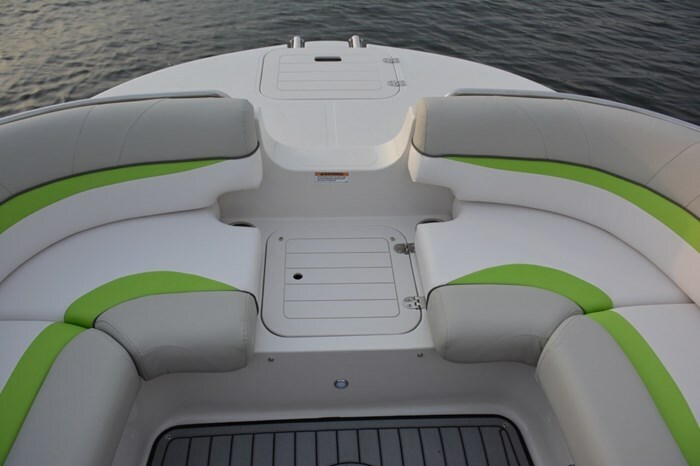 The Star Step 220 uses what they call a modified Dihedral hull design which is a fancy way of saying that this hull design – reminiscent of some tried and proven hull designs we’ve seen over the years – the dihedral hull allows Starcraft to carry the 102” wide beam all the way up into the bow. The buyer benefit pays off with tons of room, a wood grain finished dinette table, plenty of storage and an ample reboarding area outfitted with a telescoping ladder, anchor storage and a neatly tucked away bow cleat. 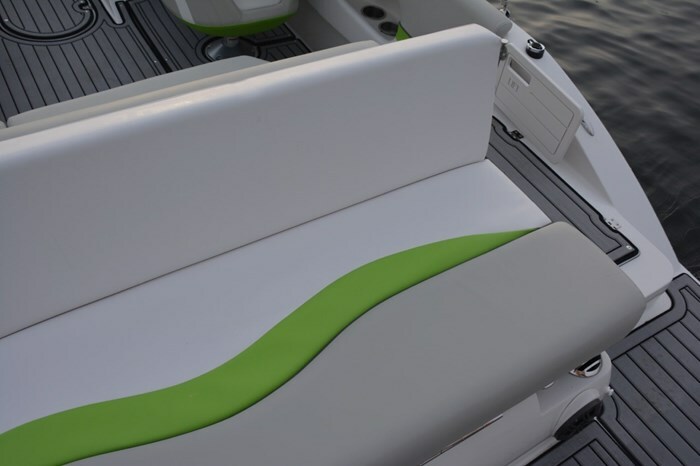 The captains seat is dressed in super soft marine grade vinyl and it readily pivots and slides to afford the driver the opportunity to participate in everything happening inside the boat. 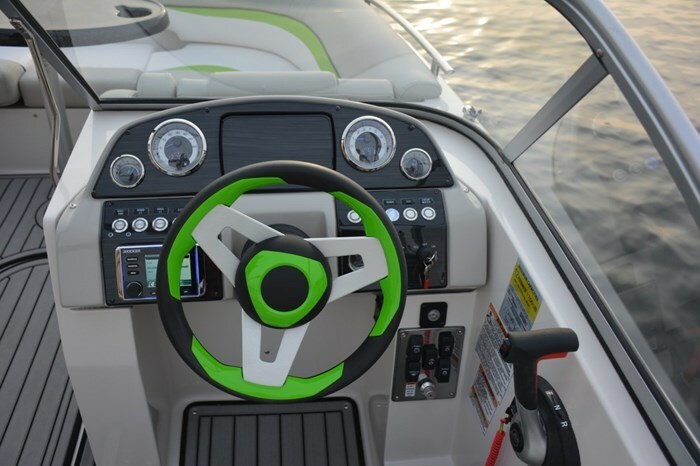 The helm layout is clear, our gauges were easy to read at any speed, the Kicker stereo was at my fingertips and I loved the colour matched steering wheel. Switches for the changeable LED lighting on speakers, cup holders, courtesy and underwater lights were all also at my fingertips. The understated highlight of the cockpit is the L shape lounger. In a boat where sport and space are so much of the focus – whether we are towing family or friends on tubes or boards or simply enjoying a lazy afternoon in the sun, the L shape lounge layout just pulls it all together. 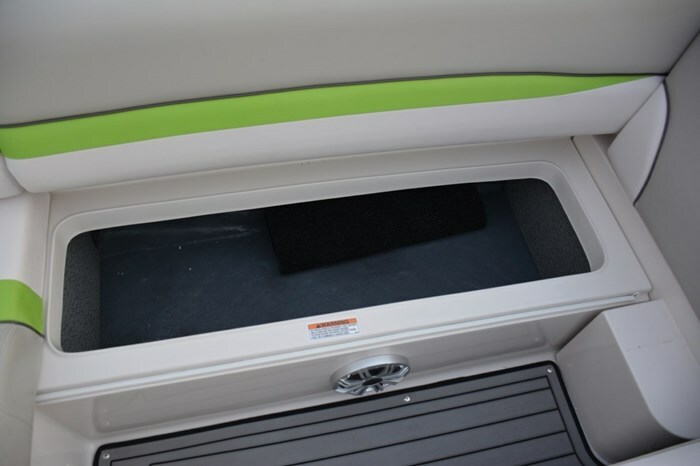 Our test boats interior was also outfitted with snap in marine mats throughout the boat – I wouldn’t have it any other way. 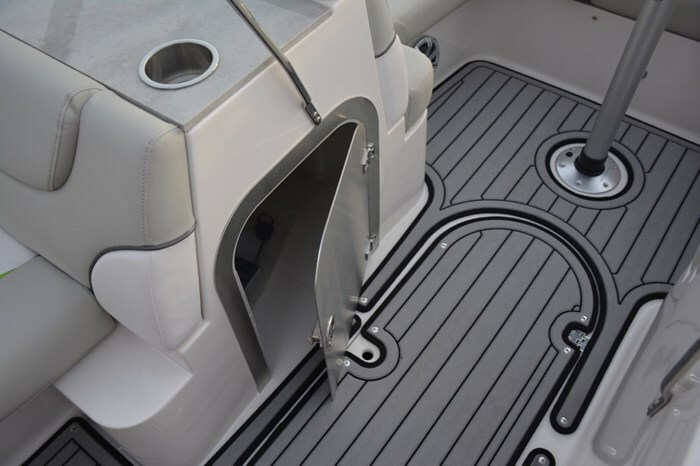 Today’s floor mats are easy to clean, quick to remove if you want to go just bare floor for the day and the style of these floors add nicely to the lines of the boat. 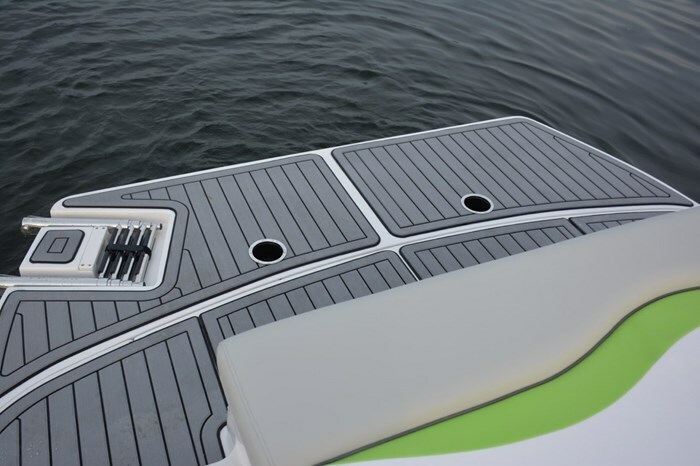 As part of the sport package our stern featured a remote for the sound system, loads of space on the extended swim platform – perfect for water sports enthusiasts to don their gear, another four-step reboarding ladder, multiple handy storage compartments, more marine matting and an incredible ‘family fun seat’. The family fun seat is essentially an easy to use convertible lounger. Looking for a giant sun pad for two? Done. Prefer a head rest for the two of you? Simply flip up the port side rest and you’ve got what you want. Want a multi position backrest on a chair built for two? Yup, she’s got that too. Starcraft call this the Star Step and the magic happens from the visible steps on either side of the hull giving the hull plenty of lift on take off and super smooth tracking and stability at any speed. 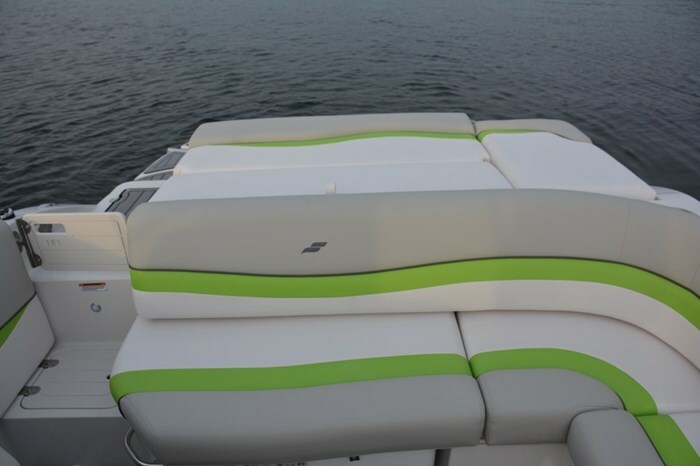 Starcraft stands behind their product with a Lifetime +6 Warranty. In essence, you get a transferrable to 2nd owner limited lifetime warranty on rivets, seams and more – ‘If they make it, it’s lifetime’. Add to that a solid 6 years on components, flooring, upholstery and electronics and you’ve got a great brand behind you ready to support your purchase. Powered by Mercury’s 4.5L 200 HP I/O our test boat comfortably delivered a top speed of 40 MPH and cruising speeds of 23 & 27 MPH with our light load of two adults and ¾ tank of fuel. So, was the Starcraft Sport Star Step 220 I/O quintessential in our opinion? 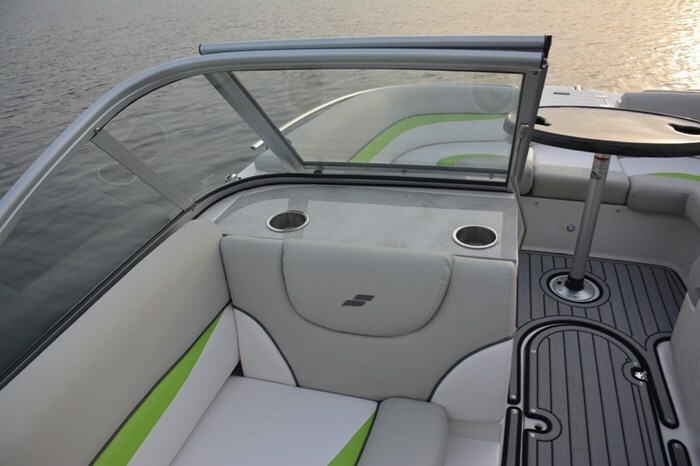 She’s got great lines; an awesome layout and that windshield is perfect for Canadian boaters. I know if I was looking for a deck boat this is one model I wouldn’t want to miss.